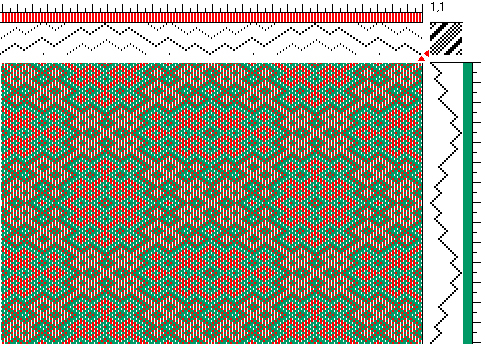 …or non-parallel interleaved twill designs would be a more accurate way of describing what I’m working on now, as I later learned from Bonnie Inouye. Bonnie gave a seminar called “Interleave” at the Complex Weavers Seminars 2014 which I was not able to attend, but in her usual generous manner she shared with me the handout for her presentation that answered some of my questions on this topic. I have done some work already using parallel threadings to weave echo designs, and now I’m excited to share some of my experience with non-parallel threadings. The first time I read about it was in Sandra Rude’s article in the Complex Weavers Journal 2006, “Adventures in Not-So-Parallel Threading, Part II.” At that time I didn’t understand any of it, but after giving it a few tries and spending many hours using the interleave tool in Fiberworks PCW, I think I get it now. Also, I bought Marian Stubenitsky‘s beautiful new book, Weaving with Echo and Iris, full of amazing color photographs that are a feast to the eyes. The book has a lot of great technical information as well with chapters on various related weaves. It’s a treasure! I like to experiment and weave samples especially when I’m learning something new. One of my first interleaved designs started out with two easy threadings that I interleaved to design a third one. In Fiberworks you can copy one threading, go to the second threading and under “edit” choose “interleave paste.” A dialogue box appears with several options and a slider that shows you how the two threadings are being interleaved as you move it to the right or to the left. 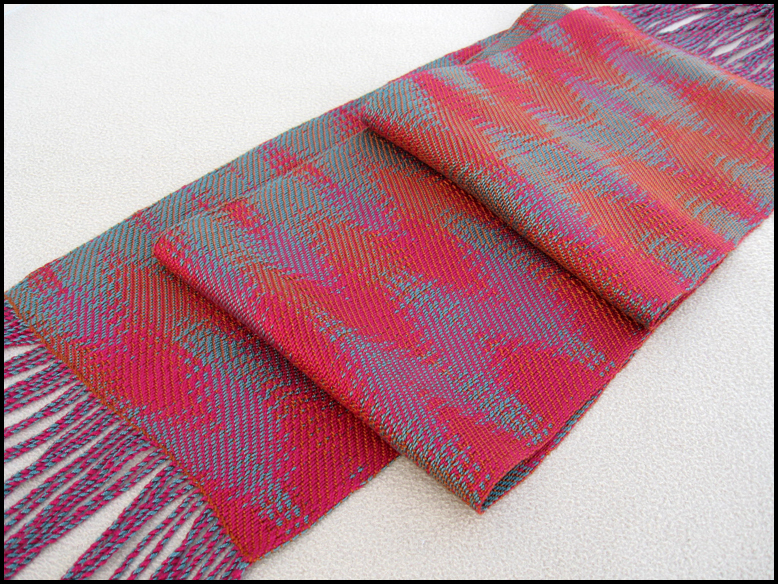 Finally, here are photos of 16-shaft interleaved echo weave scarves that I designed and wove with different patterns. I used 20/2 Tencel that I dyed with fiber reactive dyes. I was invited by our friend, Jill Beech, a ceramic artist whose beautiful work is interesting and inspiring, to show and sell some of my work at her open studio during the end of the year holiday season. That’s where these scarves will be going. Hope you enjoyed reading about my adventures in the non-parallel weaving universe. See you next time! In this post I’m pleased to share the contents of my article, “Gebrochene to Echo,” that was published in the October, 2012 (the 100th issue! ), of the Complex Weavers Journal. It is about my study for this year’s woven sample exchange of the Fine Threads Study Group at Complex Weavers. It’s such a thrill each year when the samples arrive in the mail because each weaver’s work is unique and beautiful. In my article I mention Marjie Thompson, a member of my study group and someone who is knowledgeable about pre-20th century weaving. I would like to add here that Marjie wrote a fascinating article about Gebrochene twills, “The Earl’s Canvass,” that appeared in Weaver’s Magazine (Winter 1997, issue #38) that is also included in the chapter on plain and fancy twills in Twill Thrills (The Best of Weavers), edited by Madelyn van der Hoogt. She notes that Gebrochene is the German term for what today’s weavers sometimes refer to as M’s and W’s, and that these elaborate twills seen in tablecloths have been found in medieval art and in drafts in manuscripts and books from the early 17th century. On a personal note, in case I don’t post again before the end of this year, I would like to wish an early Season’s Greetings and a happy and healthy New Year to weavers, followers, and all visitors to my blog! And now here’s my article. If anyone would like the WIF file for any of the drafts, let me know and I will email it. 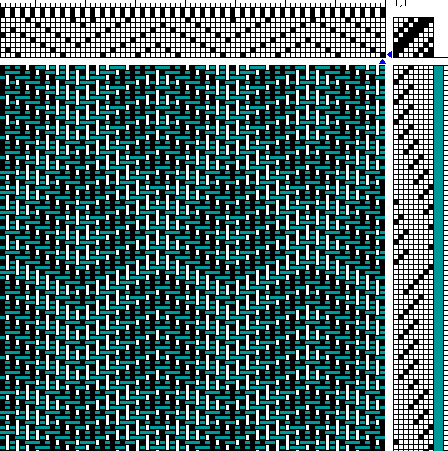 A few years ago I designed a shadow weave pattern with parallel threading. Going beyond the mostly plain weave structure of shadow weave, I recently wove my first pattern with a recognizable “echo,” also designed with parallel threading and wanted to learn more. 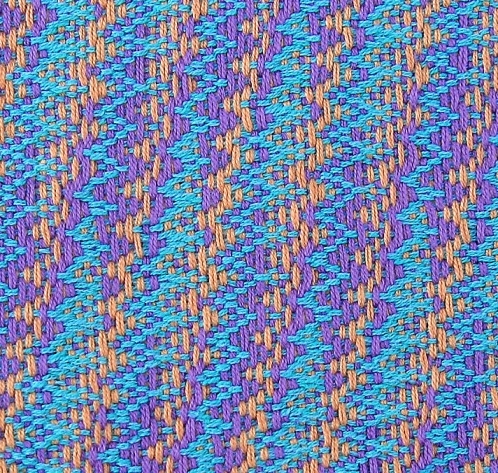 The woven samples for this year’s Fine Threads study started out as a 16-shaft pattern I designed with a threading of jagged looking M’s/W’s, tromp-as-writ treadling, and solid colors in warp and weft. The drawdown reminded me of something I have seen before – Gebrochene, but wasn’t sure if that’s what it was. I consulted Marjie Thompson who is knowledgeable about pre-20th century weaving and happens to be in our study group, and she confirmed that in fact it is Gebrochene of four divisions and that she has seen drafts of four divisions in only one manuscript (see Draft 1). I really liked the pattern but wanted to experiment with it. Using Fiberworks PCW, the 1/3/1/1/1/1/1/1/1/3/2 twill tie-up was “cycled” and transformed to 1/1/1/1/3/3/3/1/1/1/. 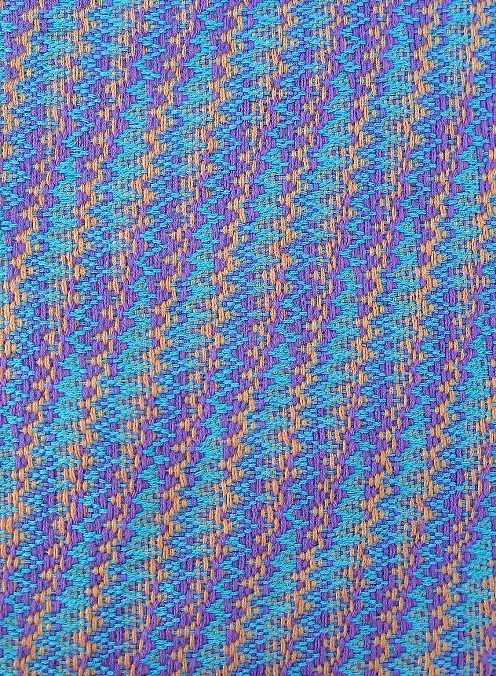 Then, when the threading was redrawn as an extended parallel repeat with alternating colors, a surprisingly delightful pattern emerged, one with several distinct areas of different colors that still resembled Gebrochene. I showed it to Bonnie Inouye, and she considers it to be an example of Echo (see Draft 2). 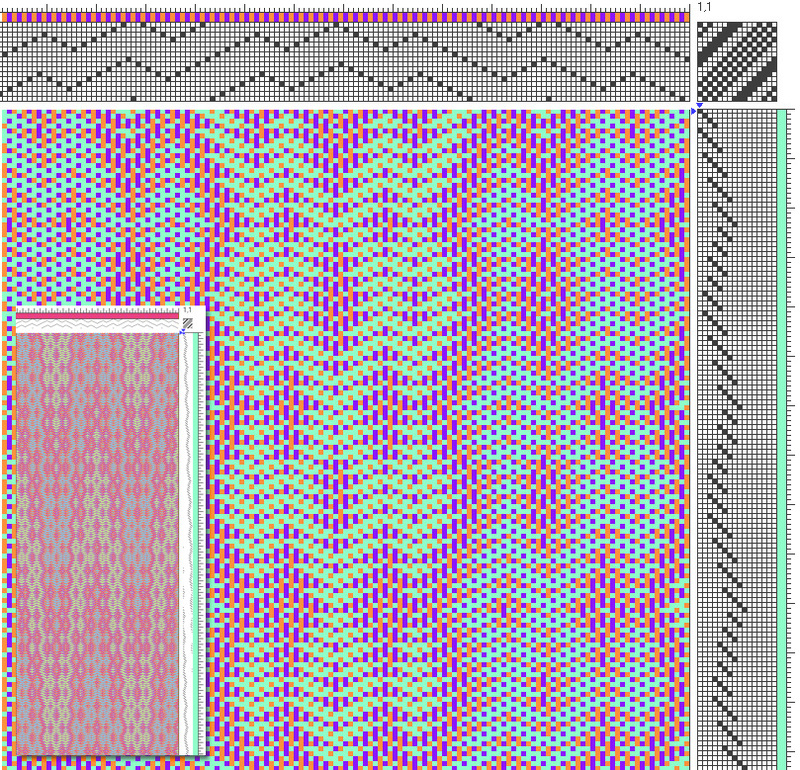 As expected, after the pattern was redrawn as an extended parallel repeat it was stretched out horizontally. I chose to compensate for this by varying yarn sizes and sett, keeping in mind that the longest float is five. Using 20/2 rayon as warp and 2/64 silk/merino as weft, I wove a sample at 42 epi and 42 ppi (two strands of weft yarn together) resulting in a flimsy fabric with an overly stretched-out pattern. I wove a second sample at 54 epi and 36 ppi (two strands of weft yarn together), an improvement, but not satisfactory. 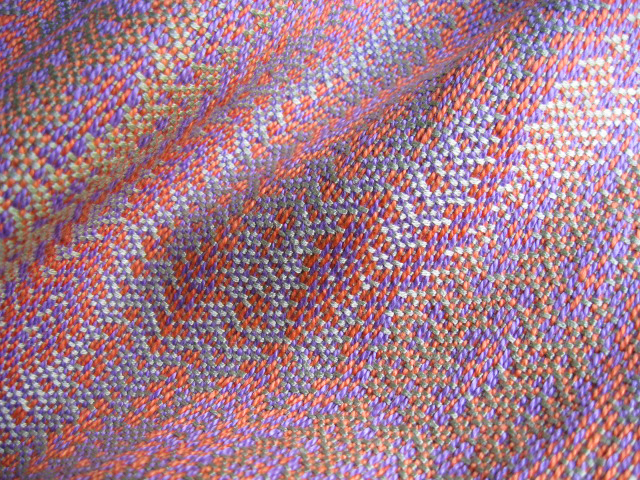 The third and final sample woven at 72 epi and 42 ppi (only one strand of the 2/64 weft yarn) is the best, structurally as well as the way the colors interact with each other as a result of a close sett, thicker warp and thinner weft. The yardage woven on my 16-shaft workhorse Macomber was hand washed gently, rolled in a towel to remove excess moisture, air dried and steam ironed while slightly damp, with approximately 6% shrinkage in length and 3% in width. I’m so inspired to go on exploring this vast, parallel weaving universe! UPDATE August 2013: you can now view the photo and download the WIF file from the Complex Weavers website by clicking here. 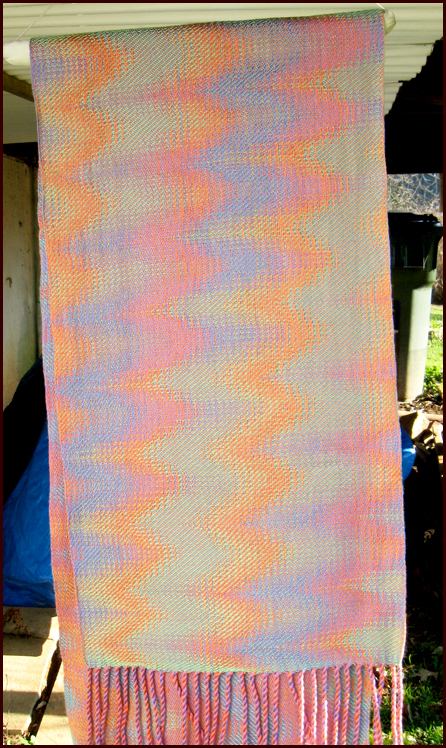 Being a newbie at weaving echo, I found the extended parallel way fairly easy with the aid of weaving software. There is also an ‘interleave paste’ in Fiberworks PCW that can be used to combine two threadings to make a new one, something I haven’t as yet explored much. 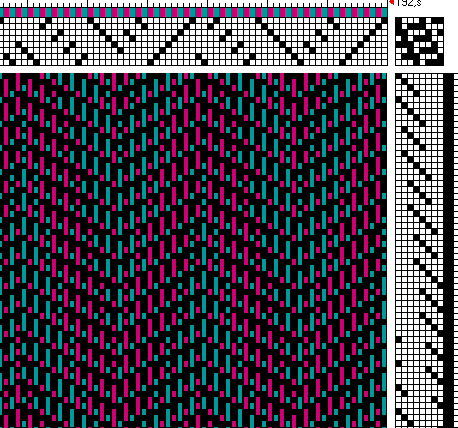 Following are images, drafts, and notes of my echo weave scarf. I included a list of sources for studying echo weave at the end. I read these articles with great interest, but I don’t understand all of it yet! As you can see in the drafts below, I started with preliminary threading and treadling drafts that were redrawn using some of the tools in Fiberworks PCW to arrive at the final draft. I also tried different twill tie-ups before choosing one I really liked. I weave on a 16-shaft treadle Macomber loom so I show the treadling in tie-up mode rather than lift plan mode, but they can easily be converted from one to the other. Because the treadling is very long it’s hard to see it clearly in the image so if anyone who has weaving software would like the WIF file of the draft let me know and I’ll be happy to email it to you. I have seen photos of beautiful, iridescent echo weavings of fine silk and Tencel where yarn size is probably larger and sett is closer for warp than for weft. I read in most of the articles that sett plays a very important role. My first try of echo weave was with 20/2 cotton with a sett of 54 epi and 40 ppi that turned out interesting with a matte finish. This time I thought of trying something different with lustrous yarns. I have lots of 5/2 pearl cotton in many colors in my stash so I decided to use alternating colors of purple and orange at 24 epi for the warp and 2 strands together of a pale green 20/2 rayon for the weft. I tried different yarns as weft but the 20/2 rayon doubled up looked good at about 22 ppi and the longest float at 5. I was amazed at how these three colors blended to produce subtle variations. If I had used something finer like 20/2 silk or Tencel, adjusting the sett accordingly, it would have a lighter hand than the thicker 5/2 pearl cotton I used, but the drape is nice this way too. I like the way the pastel colors appear to be luminescent and changing as the light plays off the surface as you move the scarf around. The scarf was finished by twisting the fringes and then washed by hand, rolled in a towel to remove excess moisture, air dried and steam ironed while slightly damp. Bonnie Inouye’s article in the UK publication, The Journal for Weavers, Spinners and Dyers, December 2008 issue #228, “Echo Weave.” Bonnie also teaches a workshop, “Opposites Attract” in which the second day is about echo weave. Sandra Rude’s articles in Complex Weavers Journal, 2005 and 2006, “Adventures in Parallel Threading, Part I” and “Adventures in Not-So-Parallel Threading, Part II.” Also available online at Three Springs Handworks. Alice Schlein’s article in Weaver’s #32 (Summer 1996), “Echo Weave: Something Old and Something New.” Also available as a monograph from Alice’s website. 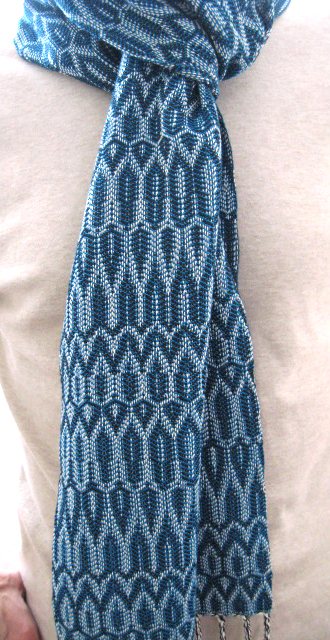 UPDATE March 23, 2013: This scarf won the Complex Weavers Award at the 2013 “Celebration of Fibers” annual members exhibit of the Philadelphia Guild of Handweavers! There’s also an article about this exhibit at NewsWorks that mentions this scarf. 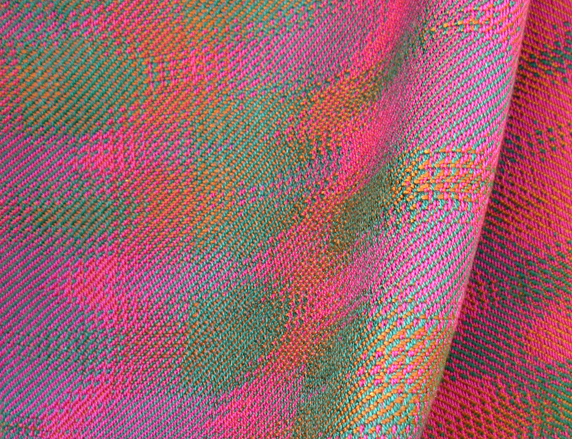 Here’s a detail of another echo scarf similar to the previous one except this time I used 10/2 fuchsia pearl cotton and 8/2 green Tencel for the warp and 8/2 orange/brown Tencel for the weft, resulting in a finer weave and a scarf with a lighter hand. These scarves are iridescent, I’m not always able to capture that quality in a photo. UPDATE July, 2014: There is a beautiful and inspiring new book published recently by Marian Stubenitsky, Weaving with Echo and Iris, the English version translated from Dutch. I just received my copy in the mail today and I’m mesmerized by its beauty and all the new information that I know I’ll be spending many hours studying. There’s a great preview of the book on Marian’s website with ordering information. 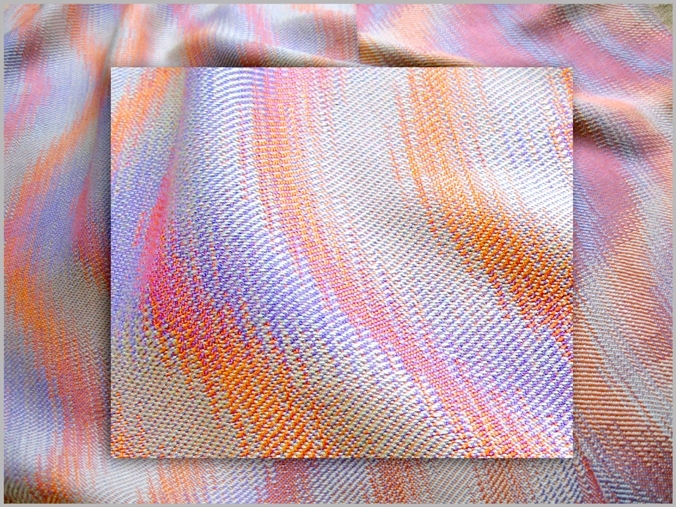 UPDATE September 2014: My new post, “Interleaved Echo Weave…” is about my experience with non-parallel interleaved threadings including a photo of a scarf with the same design as the one above except woven with Tencel. My imagination was piqued whenever I browsed through weaving books and magazines and read about advancing twills, parallel threadings, networking, and the mysterious “echo” weave. 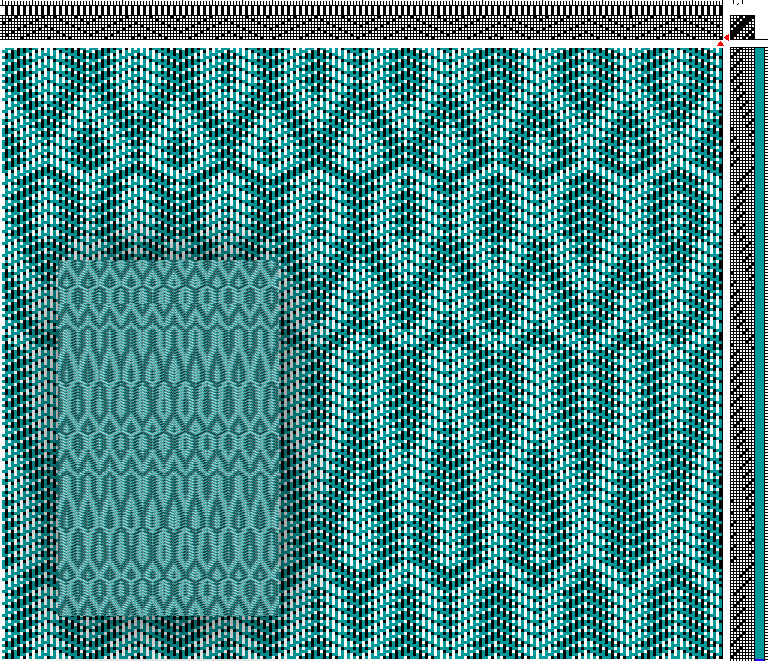 A few years ago, when I was fairly new to using weaving software, I experimented with advancing twills and networking but it wasn’t so easy. After a little more study and practice I felt ready to try more challenging projects. The preliminary drafts for the two scarves I write about in this post had the same advancing point twill threading but different networked treadlings. 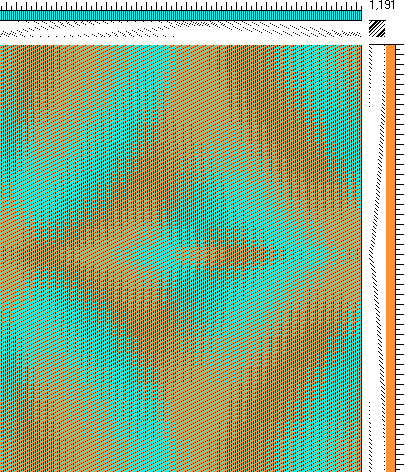 The patterns were nice but not exciting enough so I tried an extended parallel repeat of the threading and liked what I saw. 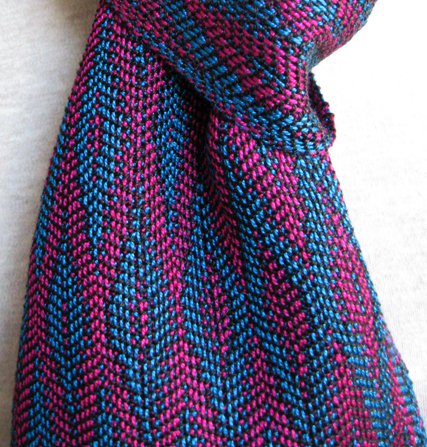 Following are images of the scarves, their drafts, and details of how I designed and wove them. There’s also a photo of my first attempt at “echo” weave. There are two views of Draft 1 below. 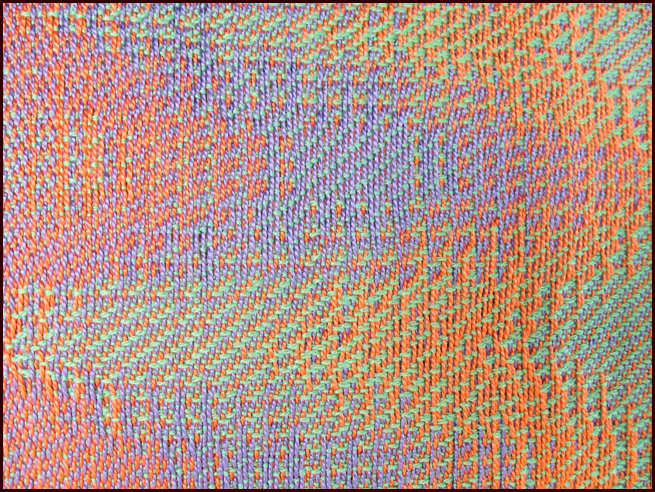 The first view is a close-up that shows only part of one repeat. 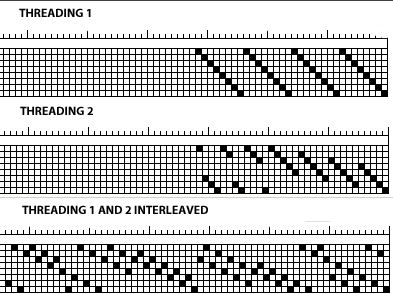 The second view shows one full repeat of the threading and the treadling with an inset image showing more than one repeat. Click on this second view for a large and clear view of the draft. 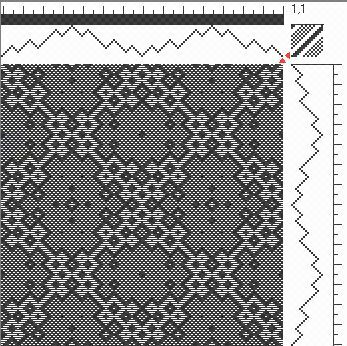 With the aid of my weaving software (Fiberworks PCW, Silver version), I modified my preliminary draft by redrawing the advancing point twill threading to the extended parallel one in Draft 1, alternating black and white warp ends. 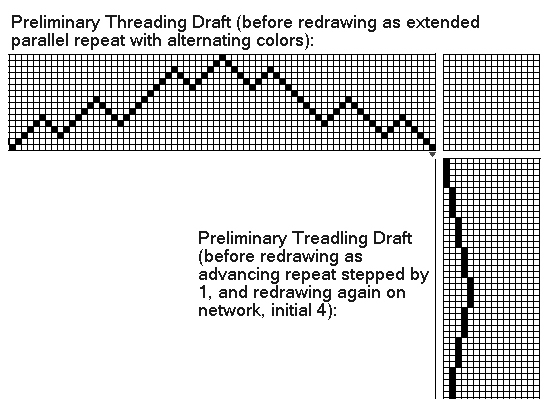 The networked treadling was easily designed using the network drawing tool that has a default of an initial of 4. I sometimes design networked drafts another way, by redrawing a pattern line on network with options for choosing different initials. The tie-up is a 3/1/1/3 twill. The longest float is 3. I used alternating black and white 10/2 pearl cotton for the warp and dark turquoise for the weft at a sett of 30 e.p.i. and about the same p.p.i. Tencel or silk would work well too and give a lighter hand and better drape. The fringes were twisted. The scarf was wet finished by hand washing, spin dried in the washer, hung to dry and ironed while still damp. Shrinkage was about 10% overall. 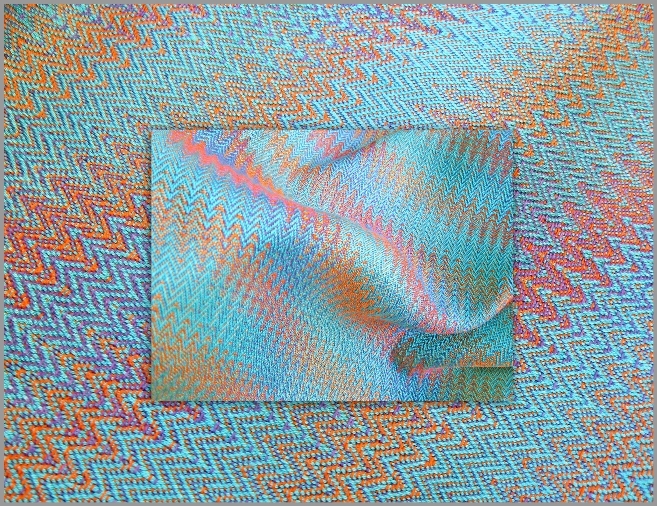 This scarf received the J. Willard Lord Memorial Award for technical excellence at the 2012 “Celebration of Fibers” annual member’s exhibit of the Philadelphia Guild of Handweavers. 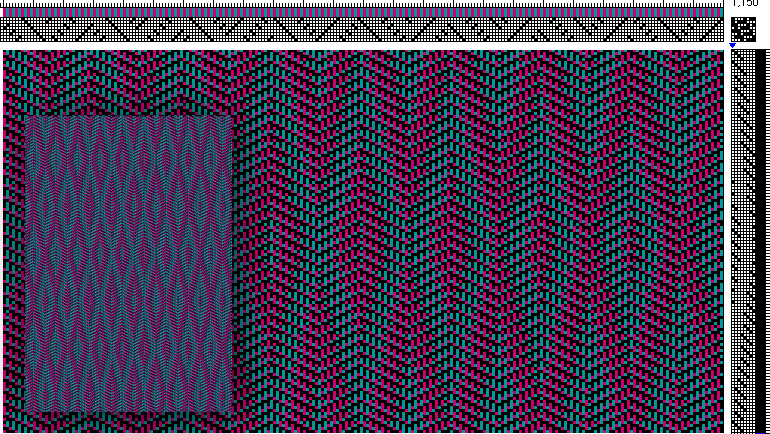 There are two views of the draft for this scarf as well and when you click on the second view the draft will appear large and easy to read. You may notice that the threading and tie-up in Draft 2 appear to be different than in Draft 1, but you can use the threading in either draft and get the same results. 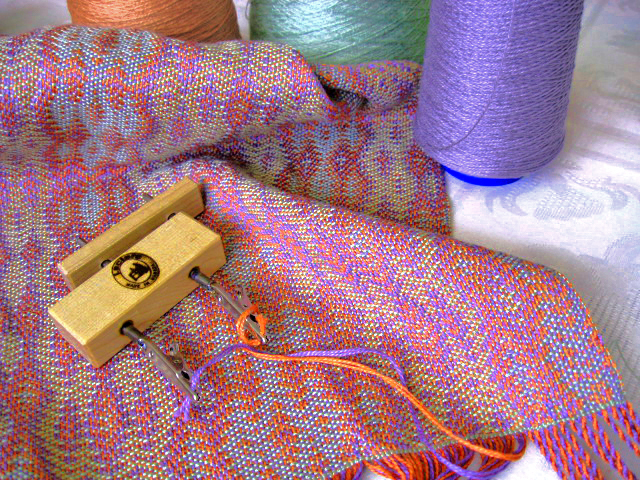 I used the shaft “shuffler” in my program to reshuffle the parallel threading so it’s easier to thread on the loom. By doing this, the tie-up was also reshuffled automatically. 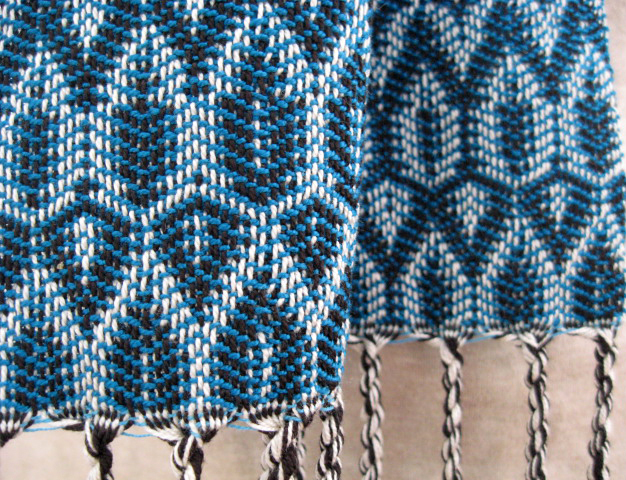 However, I designed a different networked treadling for this scarf and so the pattern looks different. I used 10/2 pearl cotton for this scarf too but alternated dark turquoise and fuchsia in the warp and used black for the weft. From a distance the colors appear to blend into a mauve color. All else is the same as for the Blue Scarf. As I continue to experiment with parallel threading, it’s not as mysterious as it seems to be, but the threading and treadling can be more complicated and variables such as the sett can make a big difference in the final result. 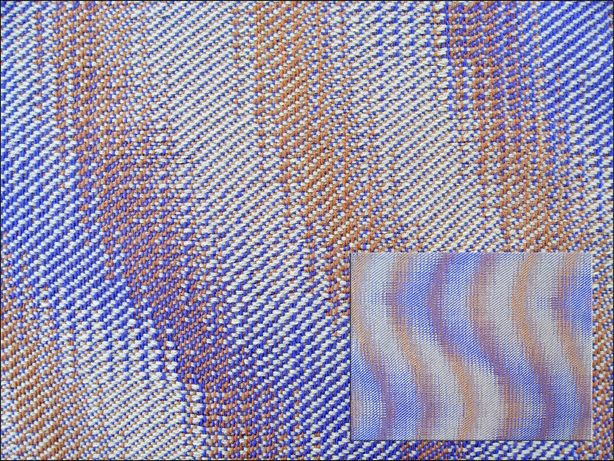 I wove my first “echo” weave fabric, designed with a parallel threading, on 16 shafts using 20/2 cotton at 54 e.p.i. and about 40 p.p.i. (see photo below). In my research I learned that echo weave is not a weave structure, but a method, and you recognize it when you see it. 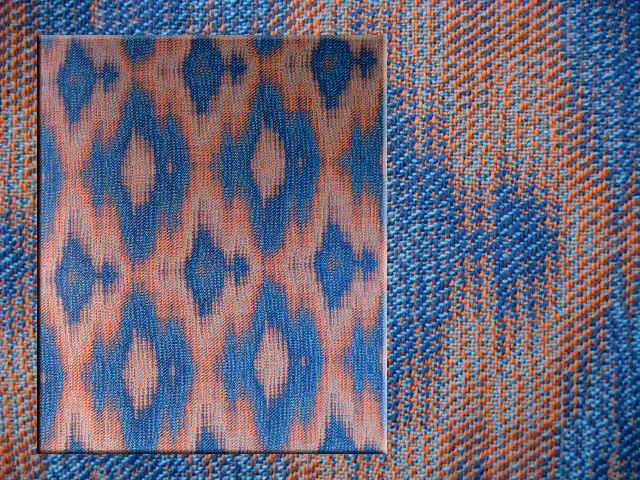 Inspiring sources for studying “echo” weave: Alice Schlein’s article in Weaver’s magazine #32 (Summer 1996), “Echo Weave: Something Old and Something New.” It’s also available as a monograph on Alice’s website. 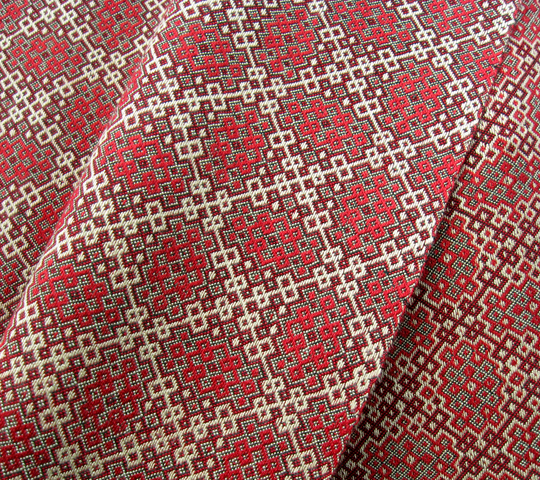 Sandra Rude’s articles, “Adventures in Parallel Threading, Part 1” and “Adventures in Not-So-Parallel Threading, Part II,” appeared in the Complex Weavers Journal in 2005 and 2006 and are available online including photos of Sandra’s gorgeous fabrics at Three Springs Handworks. Also, Bonnie Inouye mentioned on a weaving forum that she teaches a workshop that covers “echo” weave. These parallel threading projects were so much fun!